One of the cool things about our community is that there are so many yoga teachers with the intention of helping those around them feel good. Like most writers, I am trying to find fun and meaningful things that I can share with you. I joined a local yogi group on Facebook asked what I should write about next. I was so grateful to receive a lot of wonderful responses! 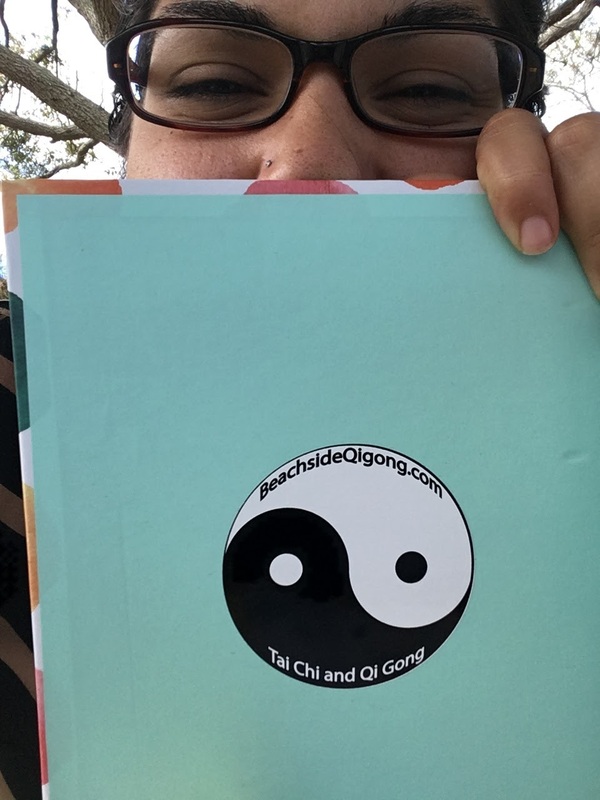 Through the post, I had the pleasure of getting connected with Gray Dix – RYT 200 Yoga Teacher at Mel O Yoga over in Palm Bay. 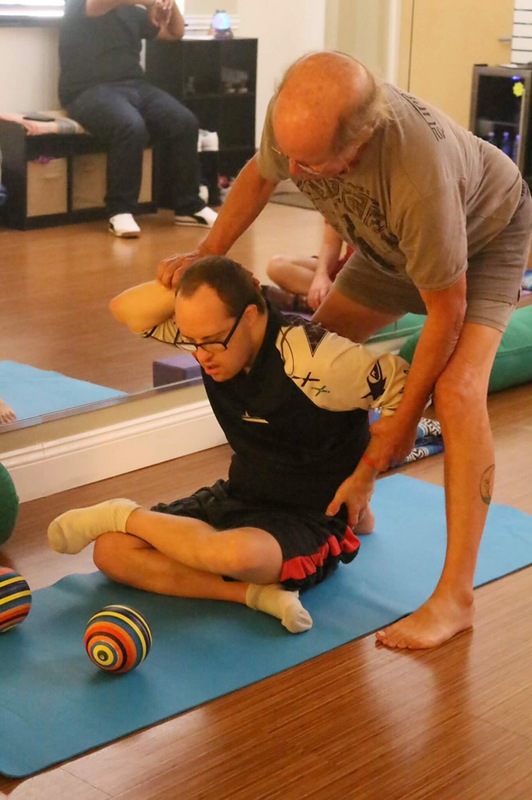 Gray Shared with me that he taught a Yoga class for the Easter Seals for adults with disabilities, and after speaking back and forth with him for a bit, it was decided that I would come and observe his class! It is a beautiful thing, how life seems to fall into place when you approach it with an open heart and mind. I made my way over to the little Mel-O studio behind Zumba Studio 321. Gray and I started to chat about our backgrounds, how we came to yoga, and how we both came to teach. We had a bit more in common then I might have originally thought! We both fostered a deep love of the benefits of yoga after going through a divorce. Flash forward a few years for both of us, here we are happily partnered with each our own new life adventure buddies. Very cool stuff! Gray has studied under or read of many of the same teachers as I have in my RYT 200, and It was brilliant to exchange a few stories with his abundant and fun-loving energy. I accompanied Gray for a walk over to the Easter Seals location which was a short walk up the block from Melo to check in, and then we head back to the studio to finish setting up before all of the students arrive. As we walked, Gray began to tell me how he came to teach this class. Gray teaches a gentle class on Friday’s that accepts food donation as payment, and this is where he met Lisa, who is the coordinator over at the Easter Seal location in Palm Bay. After attending a few of his classes, she asked if the studio would like to work with the organization. It was a match made in heaven. He began to tell me a little about each of his students, their personalities as he had worked with them, and also some of the benefits some of the students had experienced on and off of the mat. With a few months of practice, Many of the students have seen measurable improvements. Some students found improvement in communication, articulating words more often when they were generally non-verbal in the past. Many see improvements in terms of mobility. After practicing for some time, some of the students found improvements standing, dressing and also while using the bathroom, and more daily activities! So cool. Shortly after the students chose their seats and we began class. Gray lovingly remembers where each student likes to sit and what their favorite props and mats are. We flowed through postures with laughs, time for breath, and some lovely asanas to open up the back, legs, arms, chest, and neck! This was a welcome reminder to me to be sure to connect with and accommodate my students. He taught with such genuine care, offering comforting touches to the room and sending positivity and affirmation to all students before relaxation. Focusing on lesson plans, music, location, and lighting are all important, but it is so key to remember why we are here! Yoga teachers out there, learn your student’s names the best you can, ask them about previous injury or sensitivities in the body, and modify wherever you can to make sequences accessible for your students. There is nothing better than a genuine connection with your students. The relationship and community that yoga brings, is one of my favorite parts of being a teacher. It was a beautiful thing to see the smiles and sighs of relaxation that Gray helped his students to find. 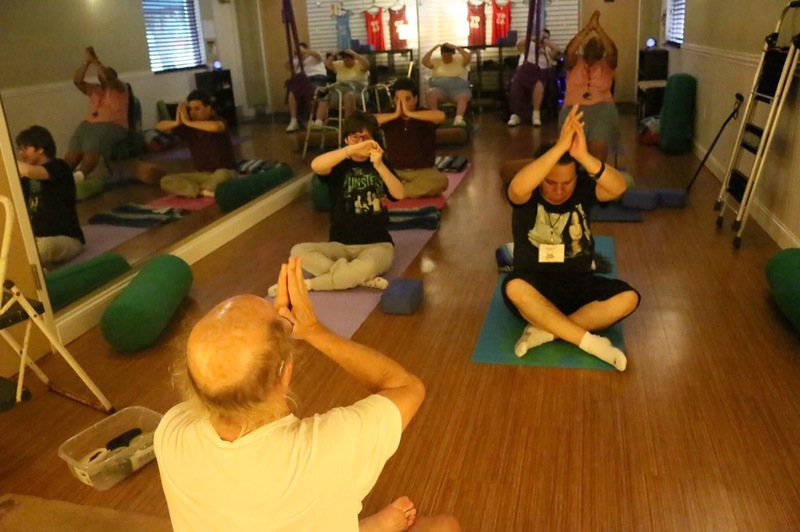 Students with disabilities can really benefit from yoga! Here are a few of the postures that we went through, and some of the modification that was offered if you have someone with special needs at home that might like to stretch and breath with you! Thank you Gray! for this very important class that you provide to our community. Namaste Friends! 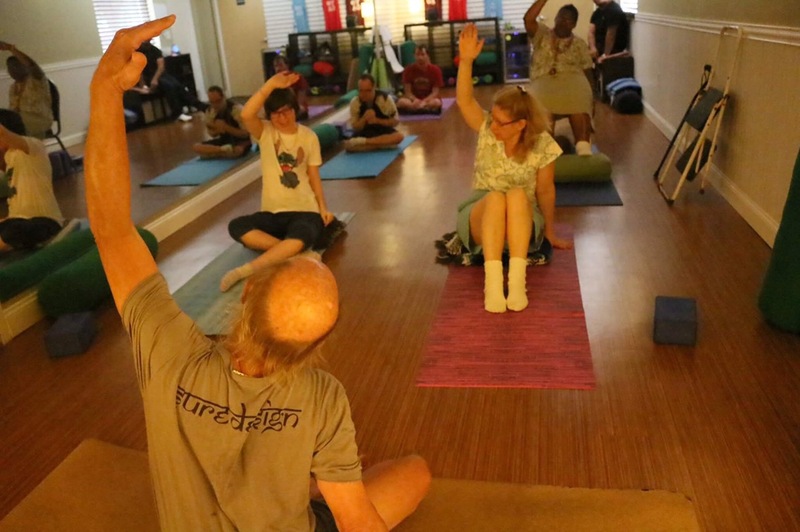 Feel free to comment below on thoughts or pass this article along if you would like for others to learn more about the cool things going on to give support to our community through yoga. Hi there 🙂 – I thought it was time that I covered a rather intimate topic… Eating! What’s closer to us than what we each choose to give our bodies each day to function. So many different preferences, tastes, and foods. As a teenager and young woman there have been times where I’ve scrutinized my looks, taken a yo-yo diet, and tried questionable pills and “herbal” teas in order to lose weight. None of these gave lasting improvements in my life. There have been times in by life where I was carrying more than I needed to on my body, and that made some things uncomfortable for me. That being said, I was doing a few things, (in hindsight) that were’nt really helping me feel any better. If you struggle with finding a healthy meal plan to suit your lifestyle – You are not alone. Even if what I, or another person eats doesn’t work for you………. there IS something out there that will, and I encourage you to keep looking, trying, and eventually you will find something that feels right for you. Drink lots of water. Water with fruits in it (try rasberry! ), water with vegetables (try cucumber!) in it, Water blended with frozen fruit and plain ‘ol water. Just drink it. Being hydrated makes life better. Drink less soda, juice, sweetened milks, pre-bottled tea, and drinks made with artificial sweetener. These don’t help you!! Both types of sugar are added to products so that you will be addicted to them. There are many studies coming to light showing that companies exploit this for money, and sugar is addicting like cigarettes. Seriously. Listen to a few podcasts. I suggest this one (my boyfriend is into Joe Rogan) to start if you are curious. Find some sort of Realistic Excersise that you actually enjoy. And not like fake like, find one you LOVE. I like to reccomend yoga – Not only because I am a teacher, but because if you take a beginner class, IT DOES NOT MATTER what you look like, how much you weigh, or what type of shape you are in, you can do it! And if you have a good teacher in a Beginner Class they will have lots of modifications for you. if you don’t like that – I also really enjoy Tai Chi, Hula-Hooping, walking the beach with my dog, bike riding, shooting basketball hoops, gardening, dancing and swimming. Also – don’t do them all at once. Do them little by little, and get days of rest. If not, you’ll just get sick of it, get really tired, or hurt yourself and probably stop completely for a while. Better off to enjoy it, starting out with one class a week. Then add in little things here and there. Read Labels – set aside an extra hour and take a long shopping trip at least once in a while. Try not to buy things with added sugar or bleached flour. It’s hard- But there are options out there. Also – There are like lists of things claiming to be healthy that just.. are not. They are the opposite of that. Here are the ones I know to be the worst culprits. Granola- most of the big brands, high fructose corn syrup is in the top 5 ingredients. Lunch Meat – Some lunch meat has a lot of fillers and isn’t really much meat. I learned this by working in a deli. Try and Cook for Yourself – Even if that’s starting with one meal a week – Try to know everthing going in that one meal. Not from a box, not pre-seasoned – Just a meal. Try to avoid office treats – Honestly, unless its something I know is made with good ingredients, why waste my time? It’s just going to make me feel icky. I cave sometimes, but I often regret it. Once you’ve been eating better for a while, sub par food just makes you sick. It’s like when you change your dog’s dog-food too quick. Just.. no. haha! I would jokingly refer to it as the path of least resistance diet… but hey… it works for me! These are just a few little things that have helped me. Is there anything special that has helped you? Is there something that is tough for you? Please share, I’d love to hear feedback. I’ve been a bit behind in my blogging – but don’t worry! I’m still here. I know that this is a good waterway for me to send out my little positive vibes. I sometimes imagine them like little paper sailboats. They may not always get to everyone, and they may not always go far, but – I think they end up going where they need to. Try them all at home, just a little bit every day and you may notice that you start to learn how to listen more closely to what your body. I’m talking about really keying in. When something hurts (like standing or sitting uncomfortably for too long), when you are tired (trying to finish something, and getting nowhere), when you are hungry, when you ought to just breath (feeling anxious or panicked), and when you really need to just blow off a little steam and clear your head. Physical discomfort and a lack of oxygen can have a really profound effect on your emotions and perception. Problems materialized out of thin air for me because my mind was so clouded. I still get caught sometimes. Often, the real issue is that I need more rest, nourishment, or a bit of alone time to clear my mind. Had I not been practicing yoga, I may not have listened to my body, I could have easily blamed someone else for my emotional discomfort, and then I would have had a meltdown or gotten angry. There are so many distractions in life. We are straight up ignoring our bodies in favor of… whatever – Phones, TV, Work, Kids, all types of things. Some important and some not. The real point is – You HAVE to take care of yourself first if you want to get anything done, and if you want it to go well. The anxiety that comes with trying to “make it” in our society and the complete disregard for self-care is …… appalling in some workplaces and societal circles. Life does not have to be this way. In my experience striving for balance only makes my path smooth. Balance your busy and your rest – your yin and your yang. There are still turns, but there can be an ebb and flow, and it’s up to us to take the time to practice making those adjustments. Are you really angry at your significant other because of something that THEY did that affected you? Are you really mad at the guy in traffic, the thing your boss said, the shoe your dog chewed, the person in front of you at the grocery store, your mom, your dad, your best friend? OR are you missing something? nourishing food? rest? Time for self-care? etc? Things to think about, no? No reason for guilt and obligation if you are doing your best to care for yourself first without harming others, and then graciously assisting those around you. As a Yogi, raised Christian, I grew up hearing – Your body is a temple. I think there is something to that. Your body is your house! Your spirit is living in this body and your mind. It is your spirit’s job to take steps to care for your body and your mind. When it forgets, your body will feel that your life is in turmoil! Things will feel cloudy. 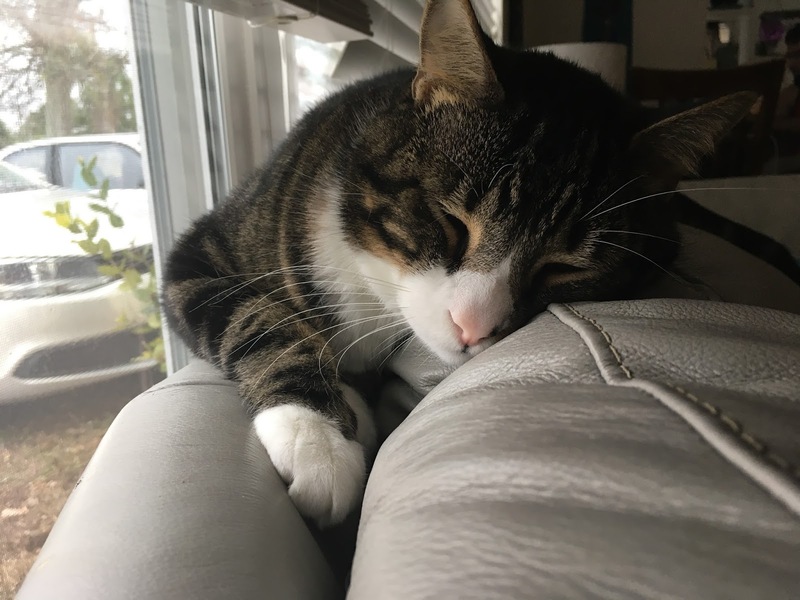 Life will be exhausting. Yoga, even simple poses – help me practice regulating my emotions. I listen for the signs, then take notice. Listen to your bodies, heal your emotions. I know that’s not 100% of everything – But I KNOW that it is one of the things that helps. Thanks for reading. If you like this – Please share my blog, or send me some feedback! Comment, email – I’d love to hear from you. Does working more or giving all of your time and energy to something or someone who you do not truly value really bring happiness? No matter what, you can’t please everyone so why not do what feels best for you? This is something that I really struggle with. There are times when I care too much about about the perception of others and I get exhausted and caught up in the rat race. 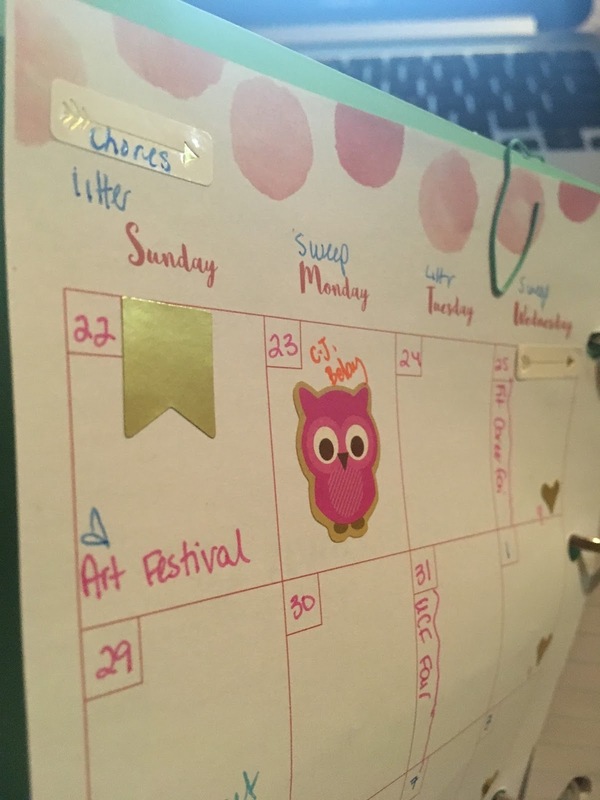 I’ve really been trying to focus on using my planner so that I can re-prioritize my life, and fill my calendar with the things that I need, not what others have in mind for me. To make sure that I do these things, I am literally writing them down and committing to it. If someone asks me to do something, I’ll check my calendar first. If it doesn’t work around the things that are most important to me…. sorry! It will just have to wait. I’ve only got one life, and I really want to feel the best that I can. Know that it is okay, to take things slow and put priority to your mental health and physical wellness. You will only be better for it in the long run! My PIC (partner in crime) and I have been trying to incorporate some basic Taoist principles in our lives in addition to Yoga, as there are many things that run parallel in the two schools of thought. He mentioned in passing that he wanted to take a Tai Chi class, and he found one online that we should do sometime. Funny Story! 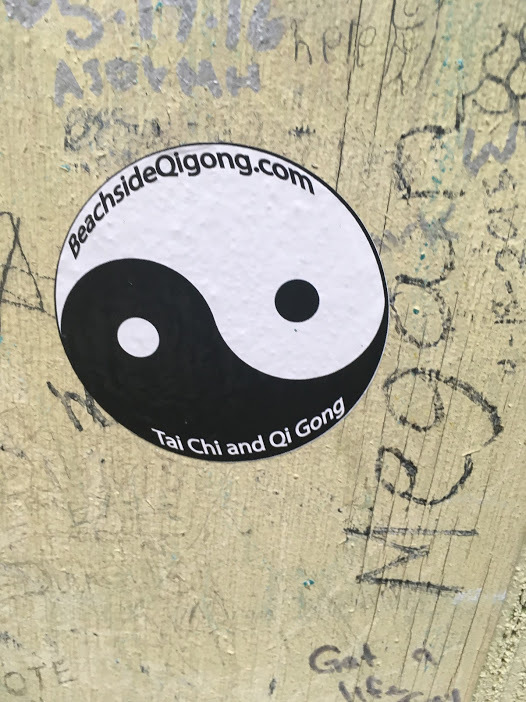 We go on a few weeks, busy with life – then while I am out at an iconic burrito place in satellite beach with my two best friends, I see a little yin yang sticker on the wall – upon closer inspection, It’s a tai chi website. So I take a picture of it.. Looked it up and as it turns out, It’s the same one! We decide to follow the signs and take the path of least resistance and we go to Tai Chi on our Saturday morning. Last week was tough, and I’ve been going to counseling to deal with some things that have happened in my life. Tai Chi really ended up being just what I needed that morning. Some call it moving medication – It’s another tool to help remind you to get in touch with your physical being. Too often people look outside of themselves to try to solve their problems, when they could be better suited to turn in and take better care of themselves. Physical and mental balance, and promoting good energy flow within your body no matter what system or religion you follow is important! Use Yoga to keep your house cleaner! 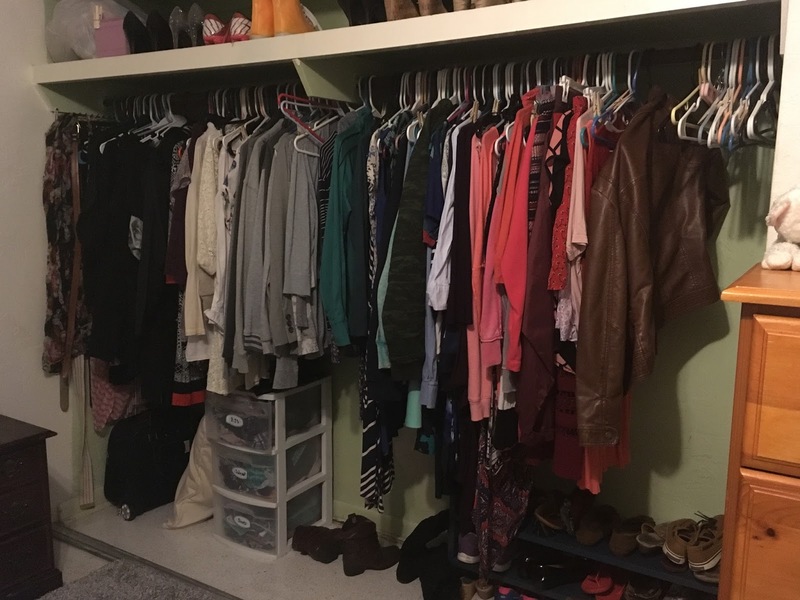 I have a very close friend who has taken the last few months to focus on minimalism in her life. Some of our friends tease her occasionally, as she has a love of Disney nick knacks (us Floridians are disney LOVERS) but I really admire the initiative. I’ve recently have been inspired to do a bit of the same as I continue my journey and studies in yoga. There are 8 Limbs of yoga, the first two limbs containing 5 Yama’s and Niyamas. Of the 5 Niyamas, I’d like to touch a little on Saucha (known as cleanliness or purity) that is one of the prescribed self disciplines to bring balance into your life. Cleaning has been ensuing in our house! Taking care of what you have, is just an extension of taking care of yourself. If you have more things than you can humanly care for – consider making some more space in your life and releasing anything not adding value. Over the past month or two, I’ve been putting a real effort toward cleaning, getting rid of things, and removing clutter from my life. I wanted to share a few things that I have done that have really helped me bring some order and balance to my chaos. First off – I do have to give quite a bit of credit to my other half for this one – his mom keeps an impressively clean house. He’s taught me the system behind “things have a place” which is something I didn’t really follow to before :P. Things had general ….areas… hrm. .cough. I really started to dig in, arrange my things in a functional way.. and then PUT THEM BACK where they belong afterward. It’s so much easier to get ready to go to work in the morning when everything has a place.. Before it was pure chaos! Where is that shirt that I want? Oh, and my hairbrush? Keys? Phone? I’d pace, room to room, trying to gather before sprinting out the door. I’d get home, scatter it around, then do it all over again. Madness I tell you. Madness! This has been a game changer. I’ve even labeled my dresser of which clothes go where (this is just how my brain works – haha), and color coded my closet. It’s beautiful and coordinated and everything I could ever want in a closet.. haha. 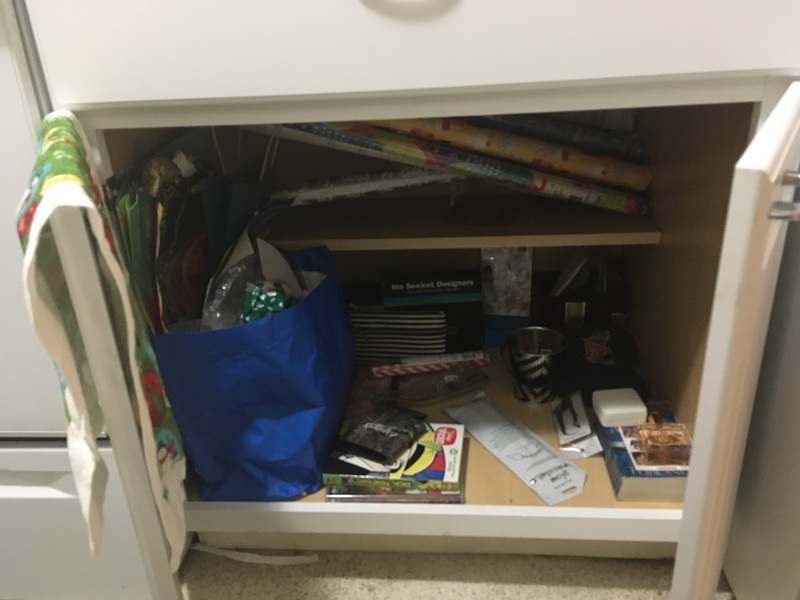 I’ve been real with myself, and set aside new or gently used things that I’m never going to or no longer using into a cabinet with my gift wrap and cards. It’s incredibly handy to have a few odds and ends to add in to a gift I’ve bought or made for someone – especially if I know that they will use it more than I would have. I don’t think there is anything wrong with a good re-gift, especially if it is paired with another little something that you did pick out special for that person. Let’s face it. You might be a little more inclined to do that chore you hate, if everything is centrally located. Cat litter, trash can, scoop, broom, wet wipes.. all within my short wingspan.. 😉 haha. The yoga corner has the incense, mats, bolsters, blocks, my dharma wheel, and little weights. 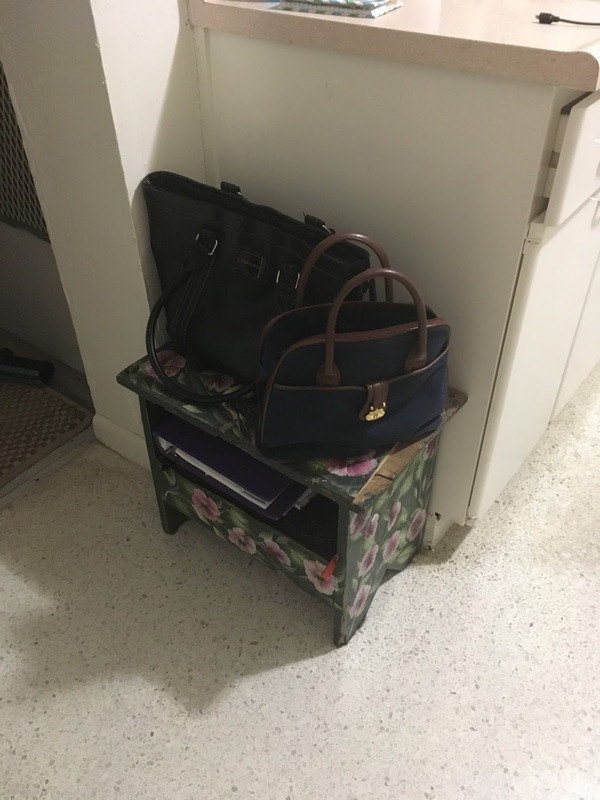 My purse area…. so I don’t drop my stuff all over the house when I get home. It was a cute little find from the thrift store. ESPECIALLY with pets, there are some things that HAVE to be done regularly. Fuzzballs and dust bunnies gather in groups in strange corners in my house…. I’ve set up a planner and laid out my week. I try my best to stick to it. The other nice thing, is even if I miss one day, I’ve set it up where it doesn’t go too long without my attention. It really makes the one day a week where I do a bit deeper of a clean that much easier. Another friend of mine gave a nice tip that he and his S.O. have put an effort toward. I remember his bachelor pad from college.. so this was impressive to me! 15-20 minutes a day can really do wonders. Put away a few things, wipe something down, maybe take out some trash or throw in a load of laundry. Because why go a week without a cat photo. All the things together – have have brought me closer to Saucha in a manageable way. Or at least as close as I’ll get for now..
Now that you mention it, Maybe I’ll do a bit of folding while I watch Avatar the last Airbender. Have a great and loving week!! Take some time, and do something for you! The importance of taking rest. When I think I’m becoming a balanced yogi – I get a little reminder that I’m human, and that of the base of everything I do, I should be sure that I’m treating my body right.I’ve been down and out this weekend – I’m nursing a bit of pain in my hip from over use from not taking enough rest. Sometimes I like to pretend I’m superwoman, like I can run all over the damn place as I please. I’m starting to realize that I’ve gone through cycles of extreme “productivity”, only to find myself exhausted because of it. Every time I run myself into the ground I say “I’m gonna take it easy. I’ll rest, let go of some commitments” For a little while, I usually do! But then ……who could have guessed as soon as I’m energetic, I’m back at it over booking and over committing! 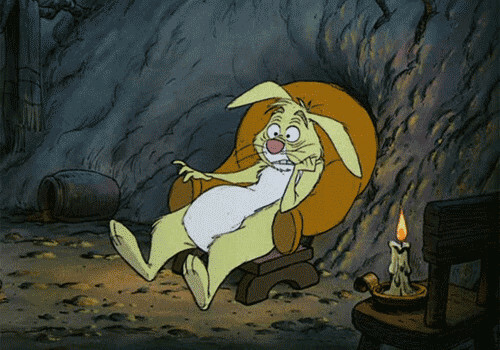 I had an aha moment, while reading the this book that, I’m the rabbit.. and maybe we all have a bit of Rabbit within us. While I am always getting tasks “completed” there are times I might be trying too hard, when I ought to just let things be, and take the path of least resistance. This week’s mantra: If you need rest, take it. So, this is a bit personal for me, but I really wanted to share some things that I have found that help ease symptoms of PMS and also for those who may have other associated issues that make menstration difficult and so BLAH. I have health issues that relate to ovarian cysts, that I have been working through for the past 8 months, and sometimes I feel extremely down and out. I’ve chosen a hollistic route to treatment, because I can see noticible differences when I take care of myself as I should! You have to be really consistent!! (**disclaimer, I am not a medical doctor, nor do I claim to be. If you have any sort of illness, this post does not replace true medical care.) I’ve been diagnosed myself and also have the care of a truly exceptional OB-GYN. Here are some Yoga poses that I’ve found provide me with some releif in the tummy area. Be sure to do all of these gently, maybe while lying in bed. Try and move with your breath here! Supine Twist – While laying flat on your back take a few moments to breath, separating your inhales and exhales. As you inhale, draw your knees into your chest, then as you exhale – gently twist over to your right keeping your shoulders flat if you are able, lowering both knees out to your right with arms wide out to a T. When you are ready, inhale back to center, then exhale over to your left. Some experts say, anything that twists you is a gently massage on the internal organs (for cramps). Also think heart and shoulder openers for any breast tenderness or swoleness that can make your muscles ache. Forward folds, with and without interlocked fingers, thread the needle, and stretched the obliques with bannana or standing half-moon. Modified Pigeon on your back.